Mangroves in the Gardens of the Queen National Park provide important fish habitat. Congratulations to my friends at the Cuban Center for Coastal Ecosystem Research in Cayo Coco, Cuba. On November 28, the Center celebrated its 2oth anniversary –20 years of conducting critical research on Cuba’s rich and diverse coastal ecosystems. Last month, the Center’s founder Celso Pazos Alberdi, and director Adán Zuñiga Rios, invited me and several colleagues to visit the Center to get a first-hand look at what they do. The Center, which is housed in the Ministry of Science, Technology, and Environment, provides much of the science that policy makers and managers use to develop environmental policies and programs for coastal areas. Their work is also aimed at ensuring that tourism and other economic development in coastal areas is environmentally sustainable. That’s no small task. With over 3,000 miles of coastline—and more than 4,000 islets and keys– Cuba is the largest island in the Caribbean and is unmatched in biodiversity. 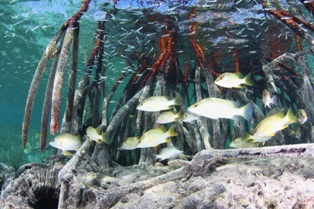 Mangrove swamps, sea grass beds, and coral reefs provide breeding, nursery and feeding grounds for many commercial fish species and also for endangered migratory species like marine sea turtles, sharks and manatees. Cuba’s coastal areas are also home to some of its most important economic sectors—tourism, fisheries, and energy development. Corals in the Gardens of the Queen National Park off the southern coast of Cuba. 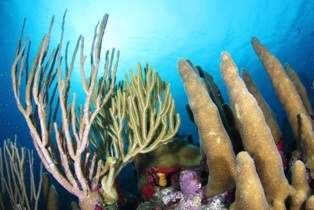 The Gardens of the Queen National Park has some of the most spectacular corals in the Caribbean. The Center is headquartered in Cayo Coco, which is part of the Archipelago Sabana-Camaguey, a string of barrier islands and keys that stretches for approximately 465 km off of Cuba’s northern coast. Over the last two decades the Center’s experts have contributed much of the science that underlies the country’s ambitious integrated coastal zone management program, which is a model for much of the Caribbean. Scientists at the Center’s field station in the Gardens of the Queen National Park (off the southern coast) have conducted studies showing that marine protected areas (i.e., areas where fishing is restricted) are effective in restoring fish populations and in protecting the country’s outstanding coral reefs. Preliminary research in the park also suggests that protecting top predators such as sharks contributes greatly to the health of coral reef ecosystems and serves as a major draw for SCUBA divers from around the world. Our group had the chance to snorkel and dive with a variety of sharks, including Caribbean reef sharks, silky sharks, and a whale shark that must have been eight meters long! EDF is collaborating with scientists at the Center and other Cuban agencies to identify effective strategies to rebuild fisheries and to conserve coastal and marine ecosystems in Cuba, the United States and the region. In my next post, I will talk about some of these projects. In the meantime, hats off to our friends for 20 great years! This entry was posted in Uncategorized and tagged Cuba, Fisheries, Fisheries Management, Marine Protection. Bookmark the permalink. Both comments and trackbacks are currently closed.